As of 2019, new golf rules apply worldwide. It is the most major revision of the rules for more than 30 years. 1. In match play a concession of a stroke may not be declined or withdrawn. When a player has his next shot conceded by an opponent then he has completed the hole. 2. 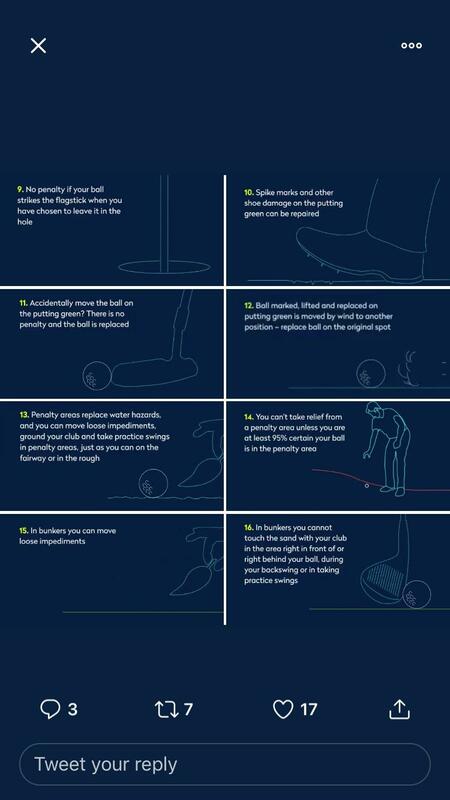 After playing a ball from the teeing ground the ball is not found, the player returns to the teeing ground and tees another ball, before the ball is played his original ball is found within the 5 minute search period allowed. He can play the original ball, without penalty, as the second ball was not in play because he had not made a stroke at it. 3. 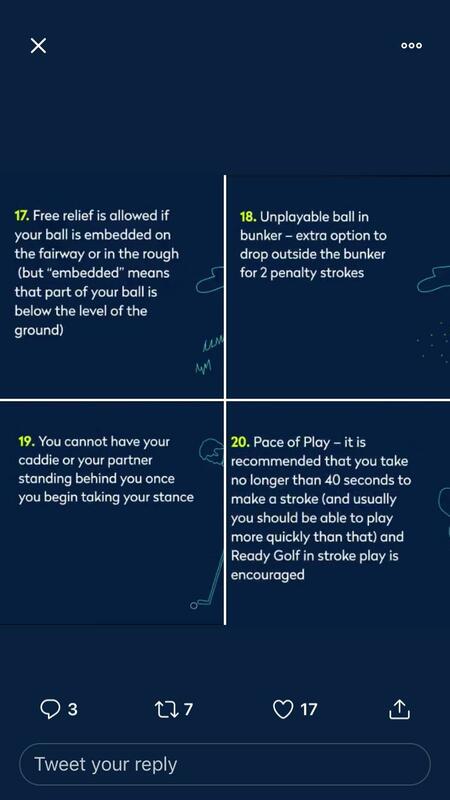 After playing a second shot on a hole the ball is not found, the player returns to the place from where the second shot was played and drops another ball under Rule 27-1. The original ball is then found within the 5 minute search period allowed. Because the player had dropped the ball, under the penalty of stroke and distance, it becomes the ball in play and the original ball is deemed lost. He must continue with the substituted ball. If he continues playing the original (lost) ball in match play the hole is lost, in stroke play it is a 2 shot penalty, if the error is not corrected before teeing off on the next hole then the player is disqualified. C) drop a ball within 2 club lengths of the spot where the ball lay, but not nearer the hole. If the unplayable ball is in a bunker and relief is taken under B and C above the dropped ball must remain in the bunker. Penalty for breach of rule is loss of hole in match play or 2 strokes in stroke play. 5. A ball embedded in its own pitch mark in the ground in any closely-mown area through the green may be lifted, cleaned and dropped without penalty as near as possible to the spot where it lay but not nearer the hole. Closely-mown area means any area on the course that is cut to fairway height or less including paths cut through rough. 6.Relief can be taken when interference from an immovable object occurs. Relief is taken, without penalty, by lifting the ball and dropping from the nearest point of relief within one club length, and not nearer the hole than the nearest point of relief. Relief, without penalty, is not available if interference by an immovable object would only occur through use of an unnecessarily abnormal stance, swing or direction of play. 7. The use of a distance-measuring device during a stipulated round remains contrary to the Rules of Golf – the penalty being disqualification under Rule 14-3 (Artificial Devices, Unusual Equipment and Unusual Use of Equipment). However, since January 2006, a Committee can permit the use of some such devices via a Local Rule. If you use such a device then ensure that the local rules permit such use. The device can be a GPS, laser, smart phone, any really; however, it is important that the device only measures distance. The use of a distance-measuring device that is designed to gauge or measure other conditions that might affect a player’s play, such as gradient or wind speed, is not permitted, regardless of whether such an additional function is used or not, and even if that function is disabled. b. 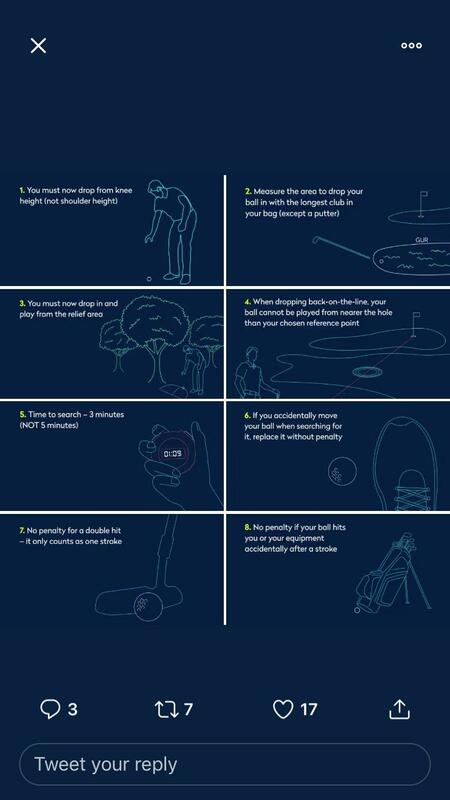 If the ball lies in or on the obstruction, the ball may be lifted and the obstruction removed. The ball must through the green or in a hazard be dropped, or on the putting green be placed, as near as possible to the spot directly under the place where the ball lay in or on the obstruction, but not nearer the hole. A movable obstruction is anything that can be moved without unreasonable effort, without unduly delaying play and without causing damage to the course. Exclusions from this are objects defining out of bounds such as walls, fences, stakes and railings and any part of the course that is defined by the Committee as being an integral part of the course. Otherwise the obstruction is regarded as immovable.